A year ago, leading up to the election, one of my biggest worries wasn't yet what Comey's influence on the election was going to be, but rather what the impact of voter suppression would be. On election night, watching the results come in, I sat at a volunteer desk at Hillary's Brooklyn HQ and scanned county-level maps in MI and WI long before the states were called for Trump. MI was going to be tight because the turnout in the Western suburbs of Detroit (like Dearborn and Ann Arbor) was far lighter than it had to be. WI, on the other hand, was lost. I looked at the numbers coming in from Milwaukee and Madison versus the rest of the state and saw what would turn out to be an insurmountable Trump advantage. The fringe Obama voters hadn't turned out... Or had they? I wanted to believe that there was some merit to their findings but I replicated the results that the two Nates each independently put out and came to the same conclusions. When you factor in demographics, the impact of voting machines comes out to be statistically insignificant. It soon became apparent that he was not looking for help, rather he wanted to continue asking for donations to support his dubious results. Word of caution: his methodology is flawed and he's running with a very much unproven conclusion. He continued to ignore my requests and then went on to Tweet about how Southern States had been experiencing stolen votes since the Nineties. Basically he was ignoring the party realignment that had occurred. Instead, he was chalking up the Republicans' statewide election wins to stolen votes. Of course, anyone who did in minute bit of research about politics in the South would know that while registered Democrats outnumbered registered Republicans, many white Democrats were just residual dixiecrats who had not yet switched party affiliations, but had become reliable Republican votes since 1994. No. There are still voters registered as Dems in the South that never switched over after 1994 despite never voting Dem again. But as I pointed out to you several months ago, your proof in WI didn't involve statistical controls so you really cannot draw causality. I want to believe your story because it would have an easy solution. But I just don't trust your improperly defined statistical analyses. Switch to paper ballots. That obviously is a better method than machines, but don't expect it to be the end all. No evidence for that yet. Good luck. As I said, I hope it is that simple. I just want to see proof. The methodology 4 the graphs produced by SAILL is not flawed. I have compared her results to my results &my results were checked by 2 PhDs. I found similar results to @Nate_Cohn. 1. How can you insist there is usually no demographic relationship politically? 2. You mention precinct data but your graphs report county results. Precincts results can definitely vary within each county, right? 3. You attribute that to precinct size but have you actually looked at demographics within those Precincts? See Q1. We don't insist. We look for demographic/precinct size relationships. Sometimes we find them, often we can't. Right. So what you're finding are correlations. For causality you need to show that precincts with higher vote totals were falsely swayed. But again, a separate issue. Machines are hackable. That doesn't mean they were hacked. It means they may have been. See the difference? You guys are just drawing too big of a conclusion out of a narrow finding. That's my critique. That's why we aggregate county level results for each state. One would expect blue shifts to cancel red shifts, would one not? Yes, it depends on relative magnitudes. They might not completely exactly cancel out. But why would swing states look different from others? Demographic similarities in upper Midwest, rust belt, etc. How do these compare with same precinct results in 2012? And that means that in order for Democrats to win, we need more votes in blue precincts then they get in red precincts. All of the actual evidence shows that voter suppression plays a role in preventing that from happening. Best of luck with your work moving forward. 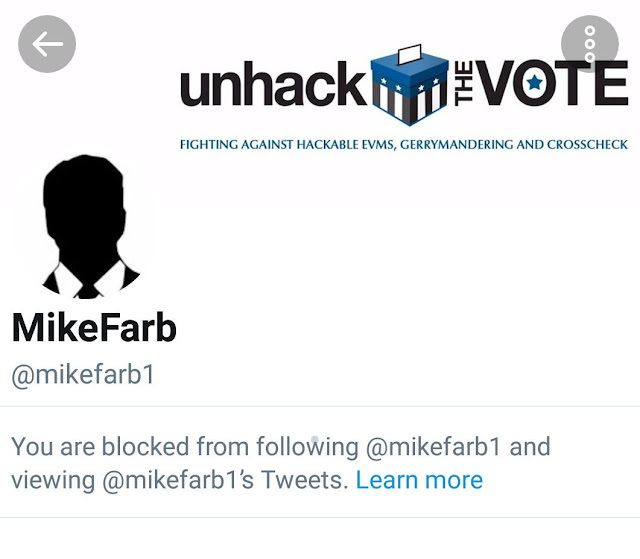 For a full account (since I was blocked shortly there after and his replies are unavailable to me), just do a twitter search for "@mikefarb1 @tgccombover." As a statistician, it is abundantly clear to me that Mike Farb wants no part of an actual statistical methodology because that would show his results are junk. And it's exceedingly tough to grift people when you don't even have the appearance of something to offer them. If you want to continue reading him, that's great. We could all use a little bit of fiction. But please don't feed the grifters. UPDATE: Looks like I'm not the only statistician he's blocked. Same here. Asked polite questions; he blocked. Statisticians don’t do that to statisticians, like ever: we critique each other & share info.